Today I'll be putting the binding on the Be Attitudes Quilt for the Holy Trinity Lutheran Youth Group Auction. (Above is a picture of the quilt top that I had taken before). I love this little quilt with words on each of it's twelve blocks. I knew as soon as I saw Nancy Halverson's Be Attitudes book that I'd make this quilt for the auction. Here are some of the blocks that I snapped pictures of yesterday as I completed the quilting on them. I'm not a very experienced machine quilter, so this has been some good practice for me, trying different motifs on each block. The cryptic little messages on each block makes it very appropriate for the Youth Group auction. The auction is to raise funds for our kids' trip to the Lutheran Youth Gathering this summer in New Orleans. Along with all the fun stuff that they'll do, the trip will also include some service work in the New Orleans community. 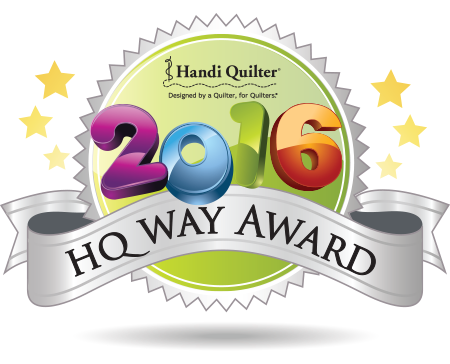 I'm so excited, yesterday I shipped out my second quilt to be photographed for publication ~ meeting my May 10th deadline early! These are some sneak peek pictures of parts of "Wandering Through the Holly". It's a big one, measuring in at 82" by 108". These pictures were taken when I was still working on the quilt top (in the wee hours of the morning ~ note the darkness outside my window). This is a section of the pieced back that shows the cute quilting that Maria O'Haver did for me. 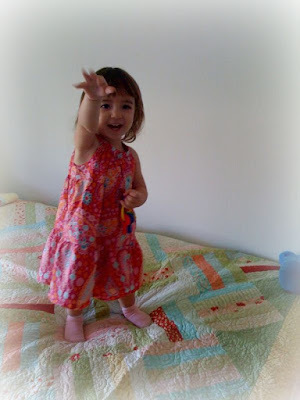 The fabric is whimsical so the quilting she did really fits it. Pat Sloan has issued a Finish It Up Challenge over on her blog. You can read the details here, but in short you can get in the running for a prize if you post before and after pictures of a past project that you take from pieces to a pieced top between now and May 22nd. So I went into my vault ~ I mean closet ~ that has many projects that look like the one in the above picture, just waiting for me to notice them, and I pulled out this bin. The Bloomin' Rose swap was from a couple of years back. I have about 20 of these blocks that are rough edge applique. They are intended to be subcut and sewn back together to other blocks for a very scrappy look. Pat had published this in a McCalls magazine a while back. The little purse swap was one on Pat's swap site that I participated in and here they sit. If I can get these sewn together with some focus fabric, they might make a cute little girl quilt to donate to Mountain Baby Blankets (they need quilts for big kids too). Then I also have my OP Challenge quilt to finish (it's still in the same condition that I left it in at the end of the online retreat weekend). I'd like to get that one done for me. Of course I have other things to finish up (Farmer's Market, Calendar Stitchery Blocks, Walk in the Moonlight, Times Remembered, I Believe...the list goes on), along with things for the quilt shop that I've started, and designs for Spring Water Designs. I think it's important though to fit in things that are just for fun/just for me, so I think I'll participate in Pat's challenge and see what I can get to. What do you have that you can Finish Up this Spring? This was the first weekend this spring that was beautiful weather and I didn't have to work the shop, so I spent it mostly outside. Sunday morning we decided to get up early and meet Lisa, Cory and Elsie in DC. We parked at Haines Point at the Tidal Basin and headed over to the Memorials. We went to the World War II and Korean Memorials. We stopped at the Reflecting Pool to visit with some ducks. We had a picnic lunch in the shade near the Lincoln Memorial. Enjoyed some cool breeze at the FDR Memorial. And walked back around the Tidal Basin to our cars. It was a hot day in DC, getting up to about 92 degrees, but there was a breeze blowing and low humidity (92 in April is a lot different than 92 in August here in the Mid-Atlantic region). Elsie Has a Big Girl Bed! ...At least she has one in her bedroom across from her crib. Lisa (also known as Elsie's mom) took these pictures and sent them to me to show me the quilt that I had made her unfolded and on the bed. Back when Lisa was pregnant, and her husband Cory (a US Marine) was deploying one week before she was due to deliver, I being the dutiful mom that I am, decided that I would go down to North Carolina and stay with Lisa to take her to the hospital when she was in labor, and sit in for Cory. Anticipating that I was going to be a grandmother for the first time, I had already of course made a quilt for the baby. I had picked up (1) jelly roll and 1 5/8 yards of fabric for some setting triangles around the edges and thought I was making a crib quilt ~ but it turned out to be huge. So I took the top with me to NC and in the couple of weeks we had while waiting for the baby to decide to be born, we hit some quilt shops and picked out some border material to add and voila, it was a simple split rail style bed quilt. Charm packs and jelly rolls are wonderful for whipping up quick quilts that look great because they are so well coordinated. And because they are generally quick to make, they are the kind of quilts that can be well used, well loved, and well washed. 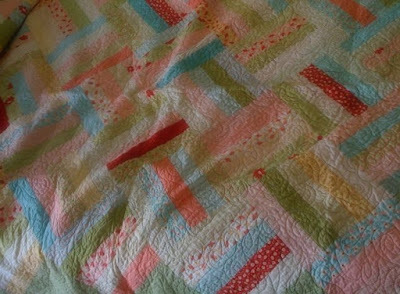 Every child needs that “sicky quilt” (the one that’s ok to cuddle them in even when they might throw up on it ~ after all that’s when they most need a quilt right?). I’ll make Elsie an “heirloom” quilt later on, but I have a feeling this one will be just as loved, maybe even more. Patriotic Punch Needle Pillow Pattern ~ Say that three times fast! I'm so excited, I've been writing and writing, and now our Patriotic Punch Needle Pillow Pattern is now available! (Alliteration courtesy Heather) The pattern includes instructions for the 4 inch punch needle design that makes up the center of the quilted pillow, and the instructions to make the quilted pillow. This will also look great framed (Heather is working on that sample now), both as the punch needle design alone or as a framed quilt block. This can be made by anyone who is a beginner in punch needle and quilting. I love the colors, it just feels so much like summer! Today I'm sharing a great blog that I've happened upon and thought others would enjoy it too! 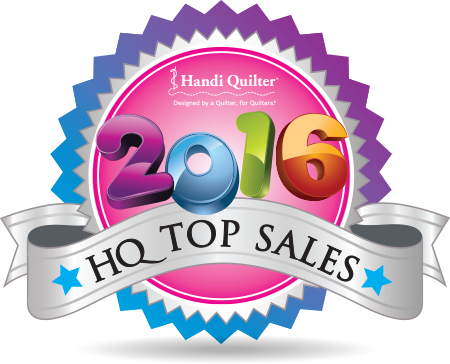 Amy at Diary of a Quilter has quite a variety of quilty topics that she shares and many are things that I really like. She has posted this cool tutorial for a 32 Minute Messenger Bag (that Heather will love). She has wonderful pictures with interesting perspective that get right to the point of the matter! 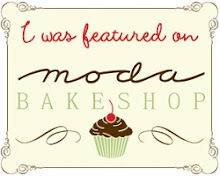 Oh, and she is having a give away for this Moda Jellyroll right now, so go on over and check it out! This past weekend was the Milltown Guild Quilt Show. We have been very busy as the show ran Thursday - Saturday and between the show and the shop I worked a couple of 11 hour days (so I will enjoy a quiet day at home sewing today). The show was very nice and I did take lots of pictures! I saw a couple of Baltimore Album Quilts from past students of Mimi Dietrich's class. This one really spoke to me. This is the block that I'm working on this month (at least I'm supposed to be ~ hopfully will get to the prep work for it this afternoon ~ too many deadlines lately). The new skill in this block is the folded rosebuds. I had already purchased a pattern from Sara Madson to do this block and I saw it in this quilt. I love the different colors that she used and I know that I want to do this block now! This block is one that I have already done, but I have so far left off the four little corner stars. This looks so nice, I think I will have to go back and add my stars after all. The other day Dawn Burchett brought in a rag quilt that she made using squares cut from her husband's worn out jeans. It was adorable! Well it reminded me of an early quilt that I made way back in the day. This one was made from strips from my worn out jeans, with some regular cottons added. I made it when my kids were little (probably circa 1990) and it spent many years at the foot of my son's bed when his room was decorated with choo choo trains and blue ticking. It is very warm! It's a classic Rail Fence pattern that I learned how to do from the book by Marti Michell called Quilting for People Who Don't Have Time to Quilt Book One. I have a copy of this great book right now in my ebay store. We all start somewhere ~ this was one of my first attempts at quilting. Where did you start? For anyone who missed this month's Jo Morton Club meetings here are some Holiday Inn projects that came in for us to enjoy! Above is RoseMary Swartwood's with her great blue border. This is Dawn Burchett's Holiday Inn coming along beautifully, she missed last month, so she just got her pattern for the final borders last night. Finally, here is my Holiday Inn again. The only change I made to it was that I used little nine patch blocks for the cornerstones to the Flying Geese border. These were from a nine patch swap that I participated in with the Jo Morton Stitchers Yahoo Group a while back, and they were just the right size! This month I gave out the pattern for the little basket quilt, so if you didn't make the meeting stop in soon and get yours. Next month will be fun to see all the different colorways that these are made in, and I'm sure we will see more finished Holiday Inns coming in! Today I'm working the shop and then going over to relieve Carolyn and work the evening at the Milltown Guild's Quilt Show. If you can come it runs today 10 a.m. - 8 p.m. and tomorrow 10 am - 4 pm. We're Having a Sew In! We're having a Sew In to benefit Mountain Baby Blankets at our Quilt Shop on Sunday, May 31st so save the date! (I'm sure I'll remind everyone as the date approaches) We'll gather at the shop from 12:00 - 4:00 and make blankets to donate to the children of the Appalachian Mountains in Kentucky. Just for fun, we will offer a demo of the String Piecing method and provide the strings for everyone to sew into donations (or feel free to work on any quilt that you wish to donate). Please bring a children's book ~ We are also asking for donations of children's books to go along with the quilts that we are donating. This is an ongoing effort, so if you are unable to attend on May 31st, bring in your donations of small quilts (crib - twin), and children's books to our shop any time you are stopping in ~ or if you are not in our area, contact me about how to donate. If you plan to come, contact the shop, it's free, but we want to make sure that we make space for everyone. This is the summer quilt made by my Great-Grandma Burton. I've allowed myself to get it out of storage now that the screens are back in the windows, and I'm hoping that warm weather is emminent. It is one of two quilts I own that she made ~ if you missed it you can see the other one here in an earlier post that I had done. 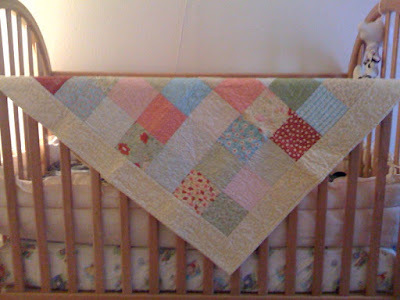 This quilt is in delicate condition with lots of wear especially around the outside blocks. My Great Grandmother made quilts for each of her children's families. This one was the one that my mother's family received, and it was well loved and used by her and her five brothers. I call it the summer quilt because it is a quilt with a top and backing, but no batting. There is light quilting on it to hold the two layers together. 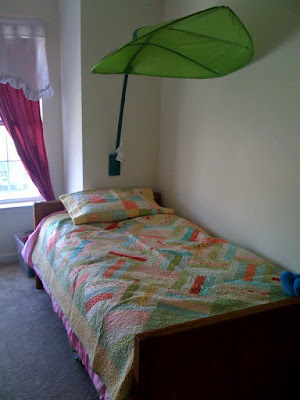 I got it out today to hang it over my upstairs banister for a while, it always makes me feel that summer is here! I like the blues and tans with just splashes of yellow and pink, and I love the way that she turned the blocks every which way. I'm going to make a reproduction of this quilt (maybe a few for others in the family too). And so the hunt is on! I've pulled a couple of fabrics, and I think I've picked out a Shirting from Jo Morton's Senica Shirtings collection that will be my background ~ whenever it comes into the shop. But I'm now on the search for the rest of the fabrics, and who knows how long it will take to find just the right ones. This part is the most fun for me, and I'll take my time and enjoy every bit of the treasure hunt. This kind of history is what quilting is all about, and I'll enjoy spending time with each and every one of Great-Grandma's stitches while recreating her treasure! A friend of mine asked to see it, so here is our quilt shop display of my Rootin' Tootin' Cowboy quilt complete with kits that are available on our website. 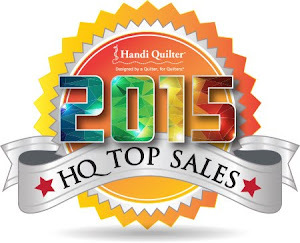 It's been so exciting to have people calling in from all over the country wanting the kit to my quilt! So far it has been people who have subscriptions to the magazine, but the June/July Issue is available on newsstands now, so go out and pick one up! (They really are on sale now ~ I got so excited when I saw Carol's subscription issue that I just had to announce it was out, hopfully I didn't have too many people running around to newstands before they were there). 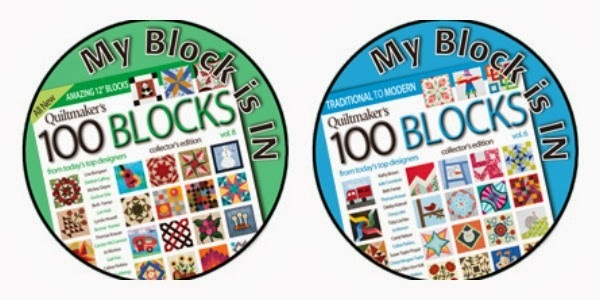 Around my area I have spotted Quilt Magazine at Walmart, Joann's, Barnes & Noble, Books-a-Million & Borders newstands. 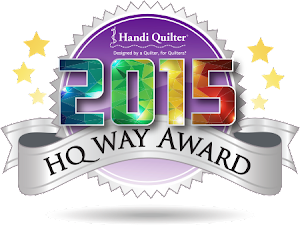 You can also subscribe at the Quilt Magazine Website. 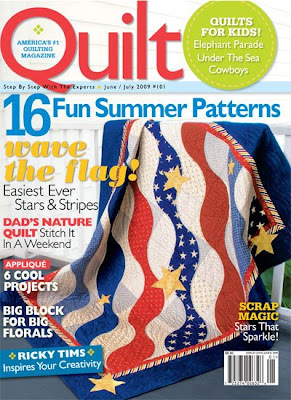 This is a great Issue to start a subscription with ~ I love the Patriotic Cover quilt (made with Jo Morton fabrics from her Fairfax collection), and it's just packed with great projects for the summer, plus articles on Ricky Tims and Bonnie Sullivan! Jo Morton Club is this week (Wednesday at 11:00 a.m. for the day group, and Thursday at 6:00 p.m. for the evening group), and I've finished my project ahead of time! How awesome is that! Here is my little mini basket quilt. I did mine in different browns for the basket blocks, the same pink print for the backgrounds and inner border, and the same green for the setting blocks. I went back to a brown for the border and will be binding it in the green print again. These colors are much more toned down than the sample in Jo's pattern, but this is the color scheme that speaks to me most :) I can't wait for the show and tell at this weeks meetings to see everyone's finished Holiday Inn quilts! I'm hoping to get some quilting done today on various projects, but it all depends on how busy I am in the shop today. I'll just work on the To Do list as time permits! It's Official ~ I'm Published!